Chicago’s weather has been all over the place the past month. One day it’s -20 outside and the next it’s 60 degrees and raining. My wardrobe and my immune system can’t quite keep up. I’ve made my Super Green Detox Smoothie and Orange Cranberry Ginger Smoothie weekly to incorporate enough fruits and veggies in my diet but I need something warm with this crazy back and forth. My saving grace has been my new immersion blender from Cuisinart, perfect for making alllll the soups and sauces. 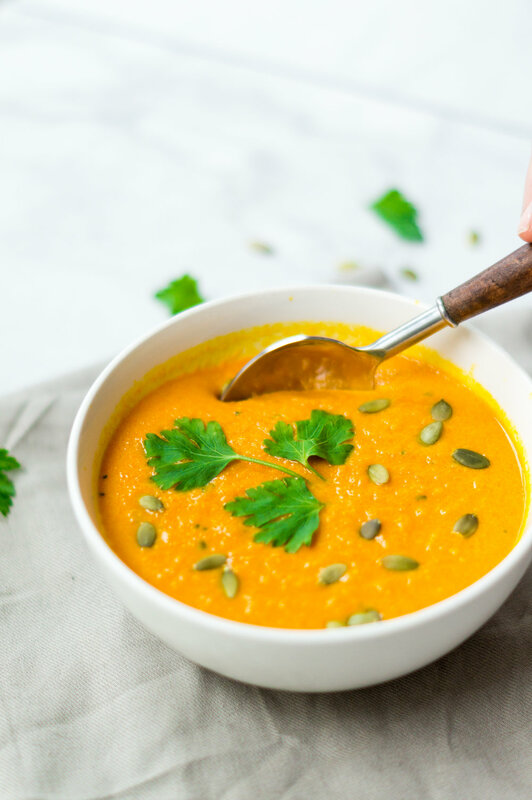 This Turmeric Carrot Soup was the first meal I made with my new trusty hand-blender and I can already tell it’s going to become my most loved kitchen tool very quickly. After roasting your carrots and garlic together for about thirty minutes, add it to a large pot with your broth, coconut milk, turmeric, ginger, and salt/pepper to taste before putting your immersion blender to good use. 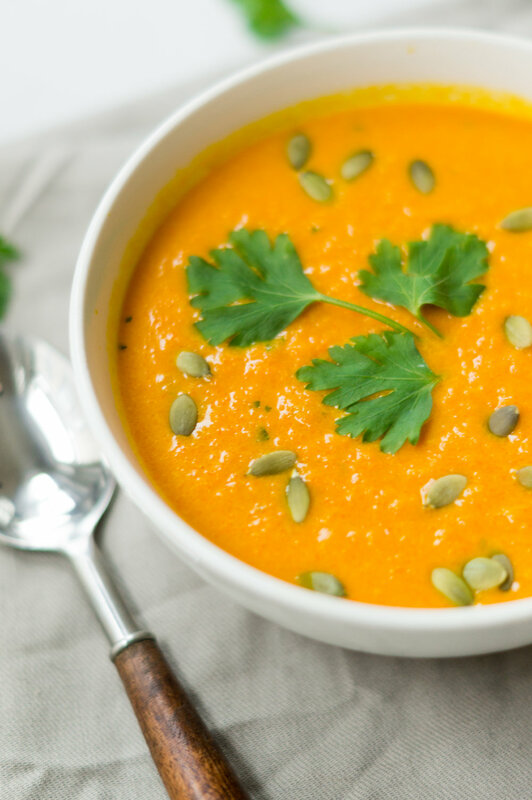 If you’re a soup lover, you’ll love this recipe not just for the flavor but also for the ease of preparing and cleaning! This recipe is Whole30 compliant so long as you don't add any of my optional toppings/additives such as the quinoa or pumpkin seeds! I personally do not participate in Whole30, but I can only imagine how difficult it must be to find something flavorful and filling when abiding by such a specific diet. It seems like common knowledge now that turmeric is the secret ingredient to at home anti-bloating remedies. I love making this soup when it’s “that time of the month” and it feels like I’ve gained 10 pounds in water weight overnight. The turmeric helps lessen my overall bloat significantly. These are just a few from the long list of benefits correlated with regularly incorporating turmeric into your diet. I often mention how I inevitably take my recipes I make for lunch throughout the work week. This soup, of course, has become my everyday lunch the past week and I will no doubt be making it again soon. It's filling but light so I never feel over stuffed. Makes 4-6 servings. One serving is about 1 1/4 cups. Preheat your oven to 425 degrees. Slice the top off your head of garlic where the outer skin meets. Drizzle with olive oil and wrap in tin foil. Place in it your oven, allowing to cook until we later remove the carrots. Shave the skin off all 2 lbs of the carrots, chopping the ends off and then chopping into halves. Toss the halved carrots in 1 tbsp of olive oil and sprinkle of salt and pepper. Place on a parchment lined baking sheet, and cook in the oven for 30 minutes. Mince your parsley while the carrots cook. After 30 minutes, remove your carrots and garlic head from the oven. Add them both to a large pot over low heat along with the vegetable broth, coconut milk. parsley, ginger, turmeric, salt, and pepper to taste. To remove the garlic cloves from the skin, simply scoop them out with a spoon or gently pierce them with a fork and add to the pot. While the stove keeps the soup warm with a low flame, use your immersion blender to quickly and easily puree carrots and garlic by submerging the blade head into the liquid and slowly moving it around the pot like you would if you were stirring it. Once everything is thoroughly blended, you can serve in medium sized bowls with pre-cooked quinoa in the bottom, and pumpkin seeds and parsley for garnish if you'd like. The soup will keep for up to 8 days after making it.